He was met with rave reviews from his extensive involvement in Chicago’s Ear Taxi Festival: “Bolter was all business as he wove together Balter’s imaginative soundscape…” (Chicago Classical Review) and “[Drew Baker’s] NOX made an altogether striking close to an absorbing, eclectic program, quite the best of the Ear Taxi events I had witnessed up to then” (Chicago Tribune). The world premiere of NOX was named Chicago’s Best Classical Music Performance of 2016 by the Third Coast Review. Bolter joined the Northwestern University Bienen School of Music faculty in 2014 as co-director of the Contemporary Music Ensemble and in 2015 was appointed the associate director of the Institute for New Music. He devotes his career to both traditional and contemporary music while constantly exploring new ways to conduct and enhance modern performance. He has also worked as an assistant conductor with the Indianapolis Symphony Orchestra and has been a frequent guest at the Civic Orchestra of Chicago. Bolter is a regular conductor and collaborator with the International Contemporary Ensemble (ICE) and most recently gave the world premiere of Marcos Balter’s Divertimento Concertante for soloists and youth orchestra and the Chicago premiere of his acclaimed violin concerto with David Bowlin as soloist. He has worked with numerous other leading contemporary groups and soloists including Fulcrum Point New Music Project, Third Coast Percussion, Spektral Quartet, IU New Music Ensemble, a regular collaborator with world-renowned flute soloist and ICE co-founder Claire Chase, and soprano Tony Arnold. He has given world premieres by composers Marcos Balter, Clint Needham, Drew Baker, Matthew Peterson plus many more and has worked closely with major figures such as Steve Reich, John Luther Adams, Esa-Pekka Salonen, David Lang, Donnacha Dennehy, Andrew Norman and others. Along with Conductor Donald Nally and Eighth Blackbird member Doug Perkins, he co-directed the mid-west premiere of John Luther Adams’ “SILA” to commemorate the new Ryan Center for the Arts building at Northwestern University. For four years, he served on the faculty at Indiana University as a staff conductor and taught graduate courses in orchestral conducting. At age 22, Bolter was awarded a fellowship from the American Academy of Conducting at Aspen. Additionally, Bolter has conducted orchestras at renowned music institutions such as the New England Conservatory, Indiana University (IU), DePaul University, Roosevelt University, and the Aspen Music Festival. Along with composers Jeremy Podgursky and Ryan Chase, Bolter co-founded the Holographic New Music Project, an ensemble and series located in Bloomington, Indiana which targeted alternative venues as well as held masterclasses at various schools. Bolter has also been widely recognized for advancing youth orchestras. 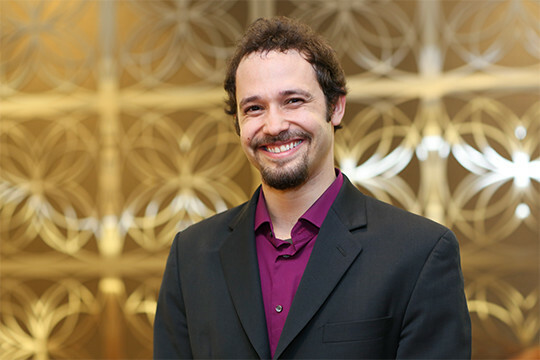 He has worked with the Chicago Symphony Orchestra’s annual Chicago Youth in Music Festival, the Oakland Youth Orchestras, Chicago Youth Symphony Orchestras, and is currently music director of the Conservatory Orchestras at the Merit School of Music, where his Philharmonic Orchestra is annually featured on 98.7 WFMT, and performs at the Chicago Symphony Center. Passionate about the cultural impact of music, Ben is the former artistic director of the El Sistema-inspired Youth Orchestras at The People’s Music School. Under his direction, the ensemble was showcased on Channel 7 ABC Chicago and has performed at a 2013 Ted Talk at Harris Theater. He has also served as music director of the New England Conservatory Festival Youth Orchestra, a three-week summer intensive program. Bolter completed his master of music degree in orchestral conducting from Indiana University in 2008 and holds a bachelor of music degree in oboe performance from the New England Conservatory. In addition to his work as a conductor, he is also an active keyboardist and songwriter and has performed in original and cover bands throughout Indianapolis, Chicago and much of the Midwest. This past August 2017, he released his first EP of four original songs produced and recorded with multi-instrumentalist and recording engineer, Chip Reardin.